You may be wondering why is it so important to have tissue biospecimens reviewed by board-certified pathologists before using them for your research experiments. Pathologist quality control on biospecimens can assure you are analyzing the correct tissue, including the anatomic site and diagnoses. This will help ensure the validity of your data and accelerate your research to reach actionable data. First, it is important to understand how tissue biospecimens for research are obtained. In most cases, an Institutional Review Board (IRB)-consented donor is undergoing a surgical resection as part of standard of care for their disease. For example presume the patient has an Adenocarcinoma of the lung being surgically resected. The surgeon and surgical team resect the tumor with surrounding non-neoplastic tissue in order to ensure the tumor is completely removed from the patient. That tumor mass is collected and is processed by specially trained personnel. Generally within 30 minutes of removal from the donor, the tissue is placed in formalin for fixation or flash frozen. Depending on the size of the tissue, it will be sectioned into multiple smaller tissue fragments to allow proper fixation and microscopic examination. 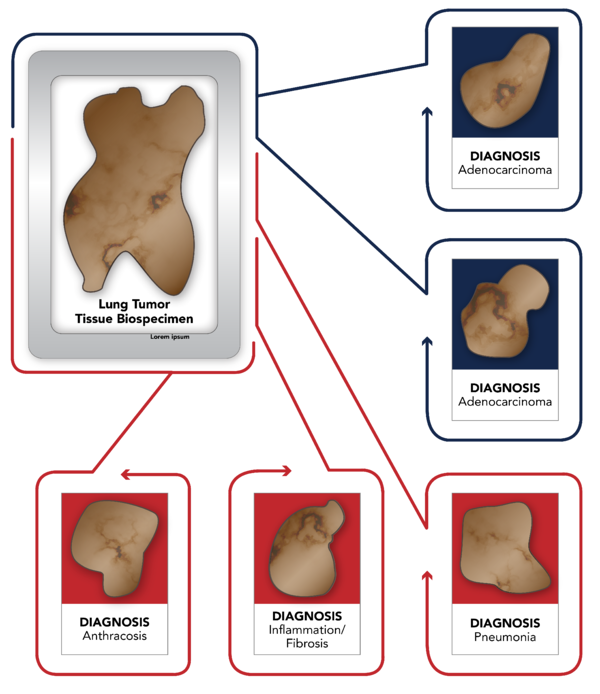 Often it can be difficult to determine macroscopically tumor from normal or diseased lung tissue, or the tumor could be intermixed with hemorrhage, fibrosis, diseased tissue or necrosis. Thus, the tissue that is present within any specific tissue block may contain tumor but could also have other areas of necrotic tissue, blood, and other lymphatic tissue or cells, normal tissue, inflammation, etc. In addition, it is known that tumors are heterogeneous, and thus the tumor that is excised may have a variation in diagnosis because of a greater volume of tumor to examine microscopically compared to a small biopsy. For example a lung adenocarcinoma could have areas of squamous cell carcinoma not present on the original needle core biopsy and should be classified as Adenosquamous carcinoma. If the average lung cancer tumor dimension is roughly 3 centimeters or 1.5 inches upon resection, this tumor mass would need to be cut down into approximately 3-5 different tissue blocks to allow proper fixation via either formalin or flash freezing and microscopic examination. Thus, you have 3-5 blocks that contain a mix of tumor with unwanted non-neoplastic tissue or could have a change in diagnosis. How do you ensure that the tumor block that you are using is what you think it is? How do you know that there is tumor present within the block that you are using? How do you confirm that the signaling you are looking at or receptor you are exploring is expressed on the tumor cells and not normal cells? How do you verify the presence of immune cells? First, a board certified pathologist will use their knowledge and understanding of current medical practices and standards to accurately diagnosis the specific block of interest and correspond this information with the clinical information provided by the donor center. In our scenario of 3-5 lung cancer tissue blocks, each block undergoes its own review and receives its own diagnosis based on the tissue that is present in the representative H&E slide of that specific block. Thus while 2 of the blocks may have a confirmed diagnosis of adenocarcinoma, the third block may have a confirmed diagnosis of pneumonia, the fourth block could show only fibrosis and inflammation and the fifth block anthracosis. In this specific case, the clinical diagnosis provided by the site was adenocarcinoma of the lung, but as can be seen in this scenario only 2 of the 5 blocks could be confirmed to be adenocarcinoma. Most importantly, using the blocks that showed only disease or fibrosis vs. any of the blocks with tumor obviously would have a significant negative impact on your results. In addition, in the example of lung adenocarcinoma a pathologist with the use of immunostains can ensure that this does not represent a metastasis or immunostaining could refine or change the diagnosis. For many tumors, a specific presence or absence of a marker, such as TTF1, Napsin A, Chromogranin or Synaptophysin are used to distinguish small cell lung cancer from non-small cell lung cancer as well as for identifying glandular or squamous differentiation and are thus important for an accurate diagnosis. Without this valued workup, the use of a specific block may again negatively impact your results. However, beyond confirming an accurate diagnosis, review of tissue blocks by a board certified pathologist offers additional beneficial insight. These include determining the percent of different types of tissue within a tissue block, tissue markup, quantitative measurements, grading, slide quality or interpretation of specific research or prognostic immunostains. Let’s review these individually to see where they add value to your research. First in determining the percent of different types of tissue within a block. As discussed above, a single block of tissue may contain other unwanted tissue. It is important to understand what percent of any specific block of tissue is tumor, with generally acceptable levels being between 30-90%. Confirming that there is a minimal level of necrosis, generally less than 10%, is useful in many downstream assays. Depending on research needs, it is also important to know if there is an immune cell presence within a tissue block. Having each block reviewed by a board certified pathologist who provides these estimations is essential to achieving actionable data. Some indications have validated prognostic stains required to determine specific treatment options. One of the most important of these is breast cancer and ER/PR/HER2 expression. The expression pattern of these three receptors – ER or Estrogen receptors, PR or Progesterone receptors, and HER2 or Human Epidermal Growth Factor Receptor-2, is essential in determining the clinical treatment of all breast cancer patients and thus are essential to many researchers studying this area. As these are validated clinical assays and their expression is known to be heterogeneous across a single breast cancer specimen, it is important that these levels are determined on a block specific level. It is equally important that a board certified pathologist determine the staining intensity and call whether a specimen is positive or negative in expression for each of these markers consistent with the validated clinical parameters. Pathologists can also be used for the interpretation of research stains, as they have a thorough understanding of the general requirements needed to validate any stain. At times, it is important to have the specific areas of interest, such as tumor, necrosis or other, marked on the slides themselves. 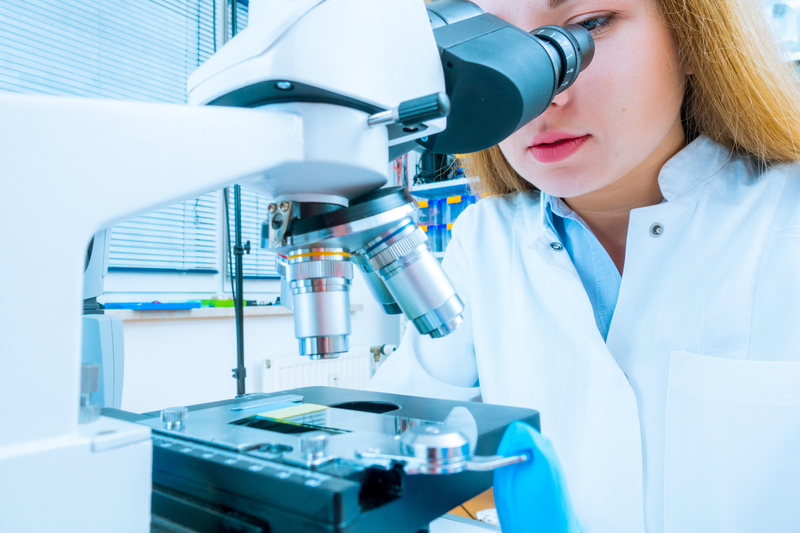 A pathologist can markup slides cut and created from client purchased tissue blocks to allow macro dissection or other determinations by automated or manual systems, etc. Another useful service available from pathologists is the quantitative measurement of pathological lesions or other areas of significance for density, frequency, coverage, etc. An independent assessment of these factors can be important in accelerating your research and achieving actionable data. Thus, having a board certified pathologist truly impacts your research and your successful outcomes. To learn more about BioIVT’s team of board certified pathologists, please visit my Meet the Experts page or reach out to us directly! In conjunction with our team of histologist and molecular biologists, we work to make sure you get the right tissue, with the right diagnosis at the right time to elevate your research.